The Royal Regiment of Artillery is an Arm of the British Army. The Regiment is made up of two distinct arms; the Royal Horse Artillery and the Royal Artillery. Somewhat confusingly both consist of a number of Regiments, which are comparable to Battalions in size. Each regiment is made up of a number of Batteries. The following list includes the Battery name, its battle honour title and the year the Battery was formed. It also includes its equipment or role, and current location. Units in Suspended Animation are not disbanded and remain on the Royal Regiment of Artillery's Order of Battle and maintain their order of precedence alongside Active Regular units. Their property, histories etc. are stored and they may be brought out of Suspended Animation at a later stage, unlike disbanded units which cease to exist and cannot be reanimated. The precedence of Regular batteries is by date of formation and was authorised by The Master Gunner in his decree of 1 November 1986. Precedence is accorded to RHA Batteries (despite their younger age) by authority of Queens Regulations 1975 para 8.001. The Order of Precedence of Volunteer Batteries is by Battery number. ^ British Army (2 August 2013). "Parade completes airborne gunners' reorganisation". Facebook. Retrieved 16 December 2015. ^ a b "Letter from Brigadier Mead". 1st Artillery Brigade and Headquarters South West. Retrieved 16 December 2016. ^ a b c d "UK Strike Brigades to have no artillery | IHS Jane's 360". Janes.com. Retrieved 2016-12-22. ^ "Facebook". Facebook.com. Retrieved 2015-06-13. ^ "BBC One - Look North (North East and Cumbria), 29/11/2013". BBC.co.uk. Retrieved 2015-06-13. ^ "Home Page". 49btyoca.com. Retrieved 2015-06-13. ^ "Joint Warriors At RAF Boulmer". Raf.mod.uk. 2014-10-16. Archived from the original on 2015-09-24. Retrieved 2015-06-13. ^ a b "Artillery Regiment Says Farewell to 137 (Java) Battery". Forces.tv. Retrieved 2015-06-13. ^ "26 Regiment - British Army Website". Army.mod.uk. 1934-11-13. Retrieved 2016-12-22. ^ a b "Army 2020 Refine for 26th Regiment RA". 26th Regiment RA. Retrieved 22 December 2016. ^ "Notice Board". Commandogunner.co.uk. Retrieved 2015-06-13. Yesterday, the Secretary of State for Defence made an announcement regarding a refinement of Army structures (see link below). As part of wider work to modernise the Army’s ability to fight at the divisional level a number of units, including 32 Regt RA, are to be rationalised, with personnel in those units being redeployed to other regiments. Further information from Army Headquarters states that this will not happen to us until 2021. I regret that I was not able to tell you all in person before leave, but I will hold a briefing for the serving Regiment when we return to work. 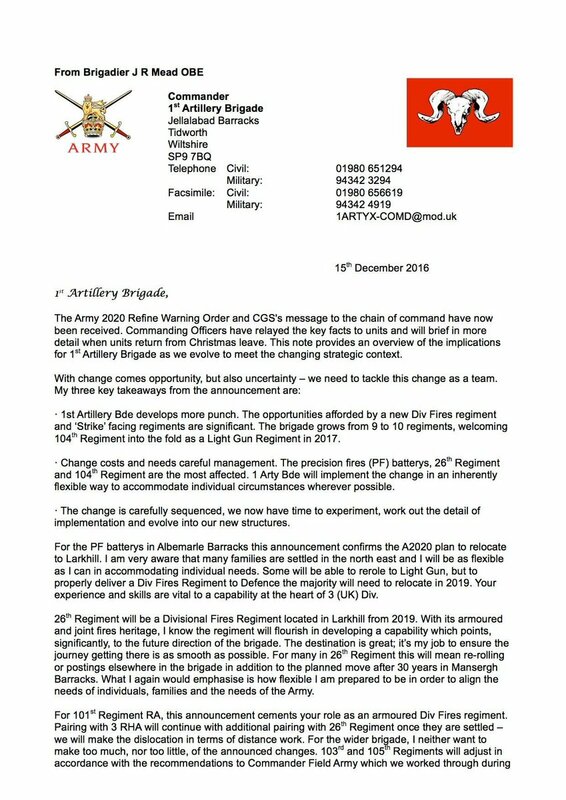 Please rest assured that nothing will happen overnight: the Regiment will stay in Larkhill until then and our Mini-UAS operational output will remain the same. The readiness cycle will not begin to change until after 2019, so the plan for at least the next three years remains unchanged. The capability you provide to Defence remains highly valued, and I am sure you will continue to deliver it with the same professionalism and enthusiasm next year. I am sure you will have lots of questions; I will speak to your sub-unit commanders over the weekend and brief you all in more detail in January. In the meantime, please continue to enjoy a well-earned break. 2016 was a busy year for the Regiment, with exercises and deployments around the world. 2017 and beyond promises to be just as rewarding with plenty of adventure and opportunity for you all. ^ "Royal Artillery battery mark Battle Axe Day - British Army Website". Army.mod.uk. 2016-02-23. Retrieved 2016-12-22. ^ Giant Peach (2014-11-05). "Livingston based, 278 (Lowland) Battery Royal Artillery Flag Raising - RA Association". Theraa.co.uk. Retrieved 2016-12-22. ^ "Watch Gunner Gary Pitt, an Army... - 16 Air Assault Brigade". Facebook. 2015-09-18. Retrieved 2016-12-22. ^ a b c "Royal Artillery:Written question - 68813". Hansard. 2017-03-21. Retrieved 2017-07-09. ^ Olver, Rob (2018-12-13). "Royal Artillery Battery Says Farewell... For Now". Forces Network. Retrieved 2018-12-24. This page was last edited on 4 February 2019, at 17:48 (UTC).